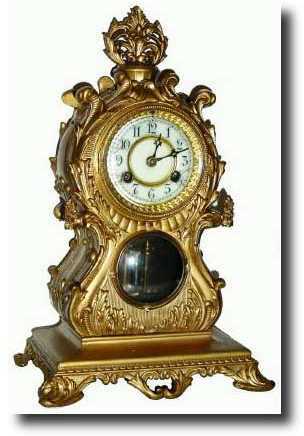 C.1906, Waterbury Clock Co., "Clymer" shelf clock The dial has numerous cracks and two small ornaments that attach on each side of the case below the dial are missing. The simulated mercury pendulum needs repair as one vial is broken and the other has come off. The case has been sprayed gold The movement is signed Waterbury, appears complete and sound, but dirty. Height 13"